Happy Tuesday Bella Gypsy Fans! Kiana here. I hope your week is going great so far! Starting to feel like summer is winding down for me. Fall sports are starting, and we have been doing lots of back to school shopping. I am not sure how our summer went by so fast! One thing that is not letting up yet are the temperatures! The barometer is off the charts here. I hate to say it but it is too hot to go outside! If you find yourself in the same predicament why not grab these great deals I am bringing you and get some scrapbooking done! The first two items I am bringing you are hot off the press! First up is Colorology: Falling for Fall. 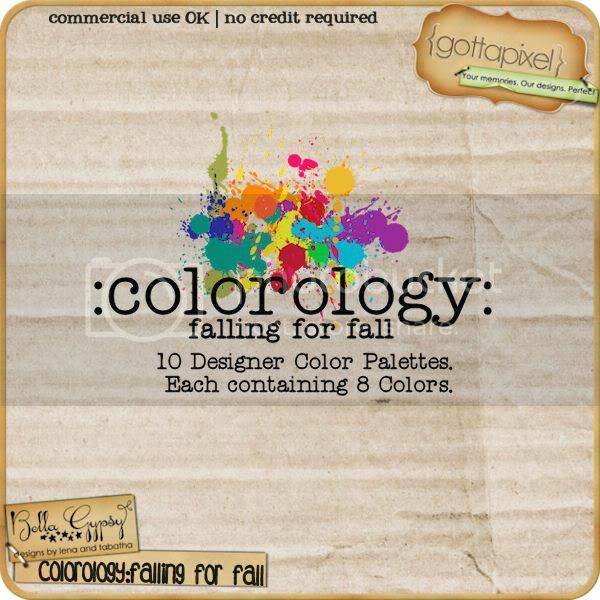 This is ten 8 color designer swatches for $1!! Next up I have an adorable kit called “Boy Meets World”. I love the colors in this kit! This kit is perfect for any baby boy pics you may have. Four fantastic kits for just $1 each at Gotta Pixel today!! And if you find yourself still needing something else to help you beat the heat this GP new release will definitely do it! The kit “Popthickle” is new to GP today. This kit is perfect for those silly, sloppy popsicle smiles. The colors of this kit are fantastic too! This kit is on sale now for 25% off! Last but certainly not least I can’t leave you without reminding you that the kit “Country Chic” along with the add-on “Love Chic Love (I do add-on) are available at Gotta Pixel. Buy the bundle and save! Plus grab it quick and save another 25%! I love when I get to leave you with a freebie before I go! This weeks freebie is an alpha that coordinates with “Boy Meets World”. Thank you for this beautiful alphabet that I will use to scrap my one and only grandson as we go back to school on the 29th. Love the double layers.